Image courtesy clickykbd. The California Academy of Sciences designed by Renzo Piano and ‘The Living Roof´s 1.7 million native plants were specially chosen to flourish in Golden Gate Park´s climate.’ There is a small terrace for viewers but the predominant role of the green roof is Ecological Space. ” This 5 story facility sweeps a wooded corner of the campus with an organic, vegetated form that blends landscape and structure, nature and high-tech and symbolizes the creativity it houses.” The green roof is open to the public and, like the roof of Australia’s Parliament Building in Canberra, is surfaced with mown grass. Image courtesy teddy-rised It is not ecological space: the grass is irrigated and mown. The building was designed by CPG Consultants. The green roof on the American Society of Landscape Architects is visual space and social space but not ecological space – at leasst not as shown in this photograph (the roof has other eco-friendly characteristics). Image courtesy drewbsaunders. 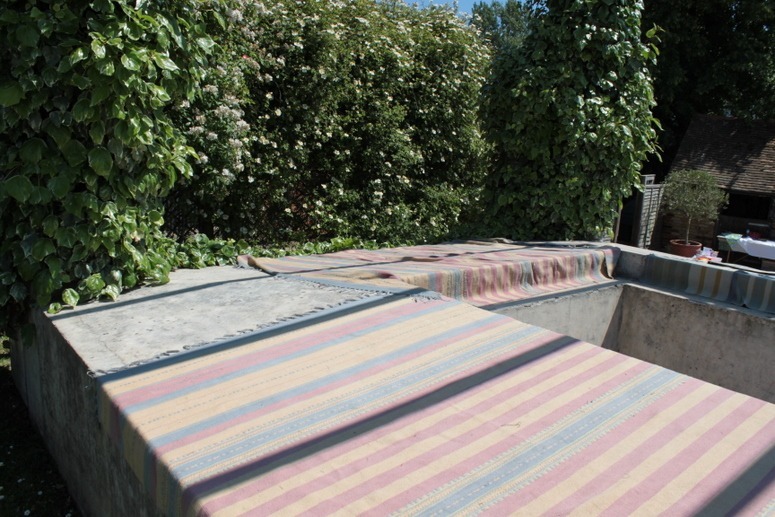 This entry was posted in Historic garden restoration, Sustainable design, Sustainable Green Roofs on 28th November 2009 by Tom Turner. 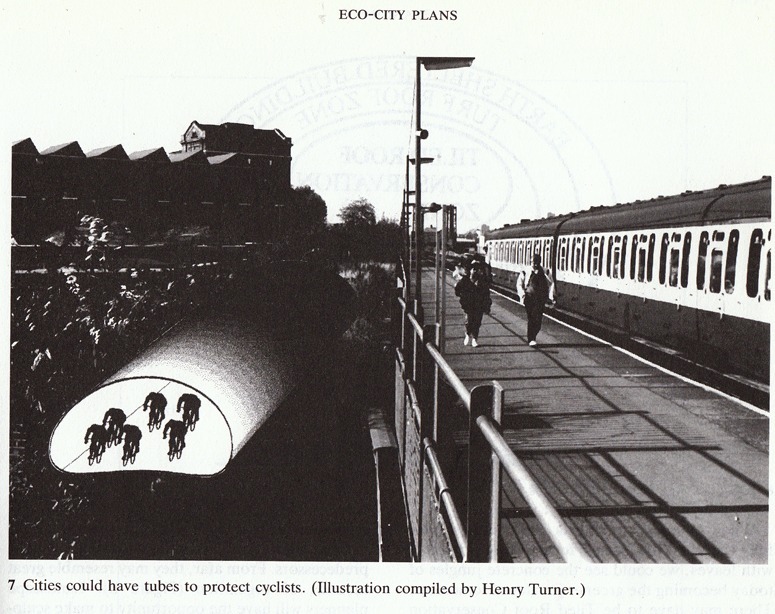 I published the above image in 1996 with the comment that ‘At some point we may be able to have a network of plastic tubes, with blown air assisting cyclists in their direction of travel (Figure 7)’. The photograph was taken in Greenwich station and the ‘slot’ where the cycletube is shown has since been used to build an extension to the Docklands Light Railway (from Lewisham to Canary Wharf). I like the DLR but, still believing London needs an overhead cycletube system for green commuters, was delighted to hear a comparable veloway has been proposed in Canada (see illustrations below). The user experience in a pneumatic cycletube would be sublime: quiet, beautiful, self-directed transport. There is an overland railway line from Greenwich to London Bridge. Bowling into the tube at Greenwich one could almost stop peddling and be carried along by air, gazing at the London panorama. Everyone would have a seat. Nobody would have to wait for a train. Journey times would be faster than by train because there would be no waiting and no stopping and no delay in exiting the station. One would glide from exit into the heart of one of the world’s greatest cities. relaxed, warm, dry and filled with the joy of life. There would of course be twin cycle tubes, with the bicycle flow and airflow in different directions. Cycletubes could also help families negotiate difficult junctions and give them safe routes to school – though the tubes would obviously have to be integrated with the urban design. This entry was posted in Cycle planning, landscape planning, Sustainable design, Urban Design on 23rd November 2009 by Tom Turner. You can download the .pdf and comment the draft of Mayor Boris Johnson’s London Plan 2009. The most interesting chapters, for me, are Chapter 6 on Transport and Chapter 7 on London’s Living Spaces and Places. The Gardenvisit website has a historical analysis of previous Open Space Plans for London and I have a special interest in Boris’s plan because he is the only politician I have ever voted for who has been elected. Briefly, my comments on the 2009 draft of the London Plan are as follows. The section on Cycling is very welcome – and Boris won my vote by supporting this cause. I hope I live long enough to ride into the capital on a Cycle Super Highway, but since Ken Livingstone promised something similar when he was first elected I am maintaining a healthy skepticism. The policy that ‘to bring about a significant increase in cycling in London, so that it accounts for at least 5 per cent of modal share by 2026’ is insufficiently ambitious. ‘In 2003 fully 36% cycled to workplaces in Copenhagen whereas only 27% drove to work’. The Blue Ribbon Strategy, also introduced by Livingstone, is very wise and very welcome. But it needs some tough political muscle behind it. The Walking Strategy, based on my 1992 Green Strategy for London, is supported by Boris as it was by Ken, with thanks to them both. The plan for a Hierarchy of Open Space in London is as irrelevant today as when it was first advanced by the GLC in 1969. I can only think that it survives because there is standard textbook a Town and Country Planning which supports this kind of absurdity. The Green Belt and Metropolitan Open Land ideas are supported for the very good reason that there would be a public outcry if they were not supported. The fact that they have no obvious affect on planning decisions scarcely matters. The Biodiversity Strategy is welcome. But there should also be a strategy for the diversification of open space types. London has far too much generalized public open space and not nearly enough specialized public open space. See blog comment on Urban parks, POS and landscape architecture. The introduction of Thames Policy Areas, based on Thames landscape strategy, is welcome but does not go far enough. 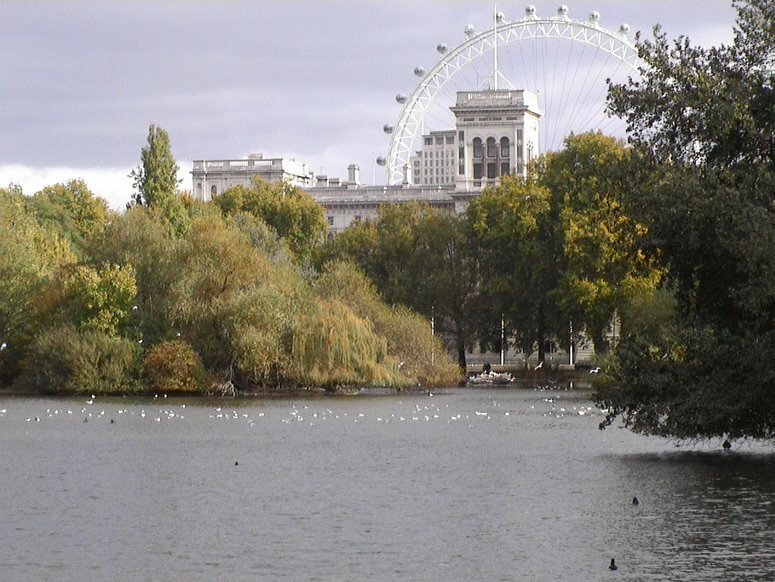 The Thames needs a Scenic Quality Appraisal and then zoning to show (1) zones where there should be a presumption in favour of conserving the existing character (2) zones where there should be a presumption in favour of changing the existing character – because the scenic quality is low. See blog comment on the Millennium London Eye. 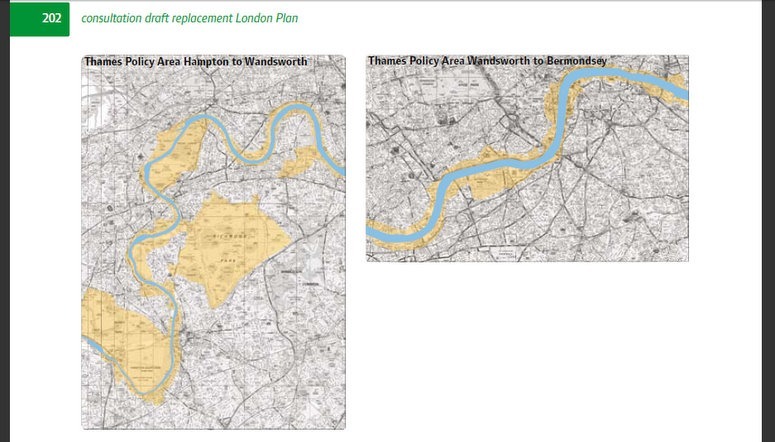 1) The 2009 London Plan is qualitatively inferior to the 1943 Open Space Chapter of the Abercrombie Plan for London. The latter is obsolete in most respects but it had the great merit of taking a simple, clear and idealistic view of the problems and the opportunities. Abercrombie was a member of the Institute of Landscape Architects and had a deep understanding of the subject. 2) If the Greater London Authority is unable to afford the cost of expert landscape consultants, I modestly point them to the Green Strategy I prepared for the London Planning Advisory Committee in 1992. The Mayor’s London Plan is over halfway to adopting the principle of a series of overlapping green networks (for Rivers, Walks, Cycling, and Habitats). These layers should now be INTEGRATED on a Londonwide basis. 3) Town planners should not have responsibility for landscape and open space planning unless they also hold professional qualifications in landscape architecture. I do not know who wrote the landscape sections of the 2009 Draft but they do not read like the work of imaginative, well-educated and influential landscape planners. This entry was posted in Landscape Architecture, landscape planning, London urban design, Urban Design on 17th November 2009 by Tom Turner. Western cities are full of echos Greek architecture, almost all inspired by surviving Greek temples which were built in sanctuaries and sacred groves as houses for gods. Greek temples were not buildings in which people congregated to pray, as Christians and Muslims congregate. As Vincent Scully argues, temples were located in landscapes which were sacred long before the temples were built. Often, these places also had sacred groves, comprising either wild or planted trees, before the temples were built. 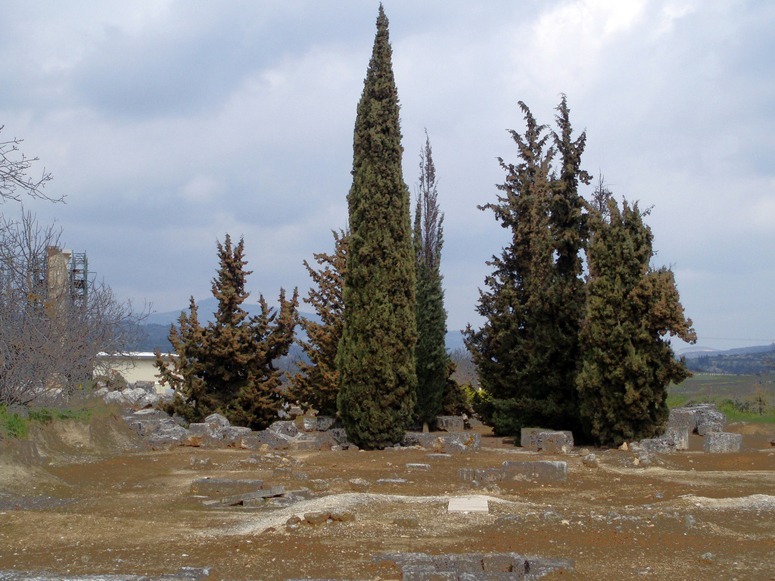 I therefore suggest that all those cities with echos of Greek architecture should also have sacred groves. They would be wonderful gestures to the origins of western landscape architecture. London’s Waterloo Quarter has commissioned a Christmas Forest for 2009, thankfully turning its back on all those centuries in which the Christians felled sacred groves. See Waterloo Forest designed by landscape architects naganJohnson. 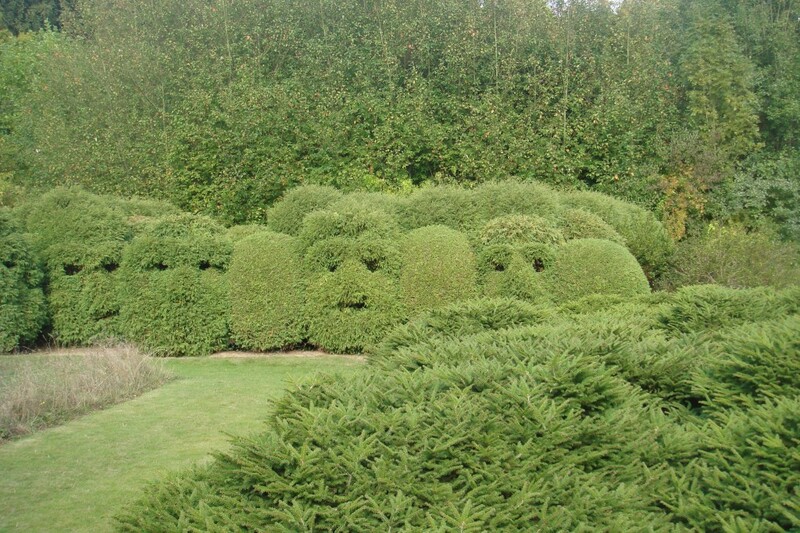 This entry was posted in garden history, Landscape Architecture on 17th November 2009 by Tom Turner. Channel 4, in the UK, did a programme on Cothay Manor Garden this evening. Mr Alastair Robb (78) and Mrs Mary-Anne Robb (68) spend £40,000/year on running the house and only get £15,000 from opening the garden to the public. Mrs Robb said, rightly, that ‘most National gardens have lost their soul’ and that running the garden as the National Trust do would wreck its character. They have four children who say ‘we don’t want to spend every waking hour working, as you do’. But the parents gave the property to one of the children, to ‘keep it in the family’ and preserve their life’s work. Not all the other children were happy with this, understandably. Ruth, for Channel 4, suggests the solution re the income is to organize events (like sculpture exhibitions) to attract more visitors and make more money. I saw this tried in several gardens last summer, including Chatsworth, Hatfield House and Mellerstain, and thought the sculpture and the gardens did nothing for each other (or for the income at Cathay). Ruth also persuaded them to build a cafe-restaurant, which made the Robbs their first ever profit, with visitor numbers up from 5,000 to 15,000. Giving the property to one child, hopefully 7 years before the parents’ death, saves £1m in inheritance tax on a £3m property. Interesting. This entry was posted in Garden Visiting, Historic garden restoration on 11th November 2009 by Tom Turner. Is the Millennium London Eye a Good Thing or a Bad Thing? Following in the footsteps of Britain’s most quoted historians (W. C. Sellar and R. J. Yeatman) we should ask: is the London Eye is a Good Thing or a Bad Thing? 30m people have ridden in the Eye (@ £17.5 each =£525m) and the owners pay the South Bank Centre £2.5m/year to rent a tiny strip of land. It thus enriches London and Londoners. This is a Good Thing. The London Eye makes Central London resemble a Theme Park: County Hall and the Palace of Westminster have lost their dignity and now resemble toys in a model village. This is a Bad Thing. The London Eye was originally given planning permission for 5 years but was then made permanent, thus enriching the owners at the expense of the public good. This was a Bad Thing. On balance the London Eye is therefore a Bad Thing and Lord Rogers was wrong. He declared “The Eye has done for London what the Eiffel Tower did for Paris”. Lord Rogers is a decent architect but has little understanding or urban design and no understandisng of landscape architecture or geography. The Eiffel Tower does not dominate the historic core of Paris. 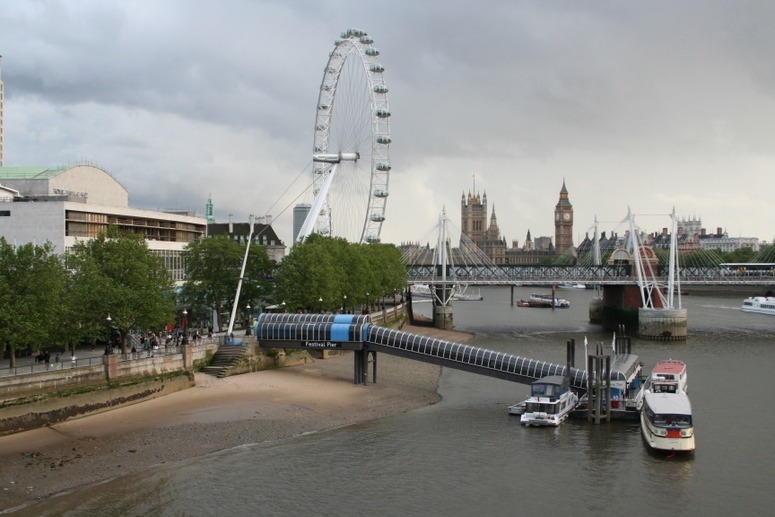 The London Eye should be moved downstream of Tower Bridge, to a site which would not be dwarfed by its scale (eg Chamber’s Wharf). It should also be hoisted by 30m (from 135 metres to 165 metres so that it is higher than the Star of Nanchang (160 m). This would be a Very Good Thing. This entry was posted in context-sensitive design, Landscape Architecture, London urban design, Urban Design on 10th November 2009 by Tom Turner. Colin suggested adding Anne Whiston Spirn’s book on The language of landscape to the list of 100 Best Books on Landscape Architecture and I said I would re-read it. It is a good book, and as a commentary on a host of landscapes, it is inspirational. As a text on the theory of design, it is disappointing. The introduction (p.3) explains that ‘I was determined to write an entire book about the poetics of city and nature, one that would fuse function, feeling, and meaning’. But the word ‘poetics’ does not appear in the index and is not adequately explained in the text (though there is a reference to Aristotle but on urban planning). Wikipedia states that ‘Poetics refers generally to the theory of literary discourse and specifically to the theory of poetry, although some speakers use the term so broadly as to denote the concept of “theory” itself’. Spirn apparently uses poetics as a synonym for ‘theory’. But her book’s strength is in its observation and analysis, not its theory. She uses language and linguistic structure as analogies but (p.4) ‘places are my primary data’. Wikipedia also tells us that ‘A language is a system for encoding and decoding information’ with ‘The concept of information closely related to notions of constraint, communication, control, data, form, instruction, knowledge, meaning, mental stimulus, pattern, perception, and representation’. While not disputing the relevance of Spirn’s analogy, I believe it needs a great deal more theoretical analysis than it receives in her book. But thank you for the suggestion, Colin: I have put it on the list because far too few people give theoretical attention to landscape architecture. This entry was posted in Book reviews on 9th November 2009 by Tom Turner. The title of Yve Gosse de Gorre’s book about his Jardin de Sericourt translates as ‘Wisdom and Folly in the Garden’. The garden lives up to the name and is filled with deep thinking leavened with humour. Like Jencks’ Garden of Cosmic Speculation it is concerned with the meaning behind the form, but less about the nature of nature, and more about the nature of man. 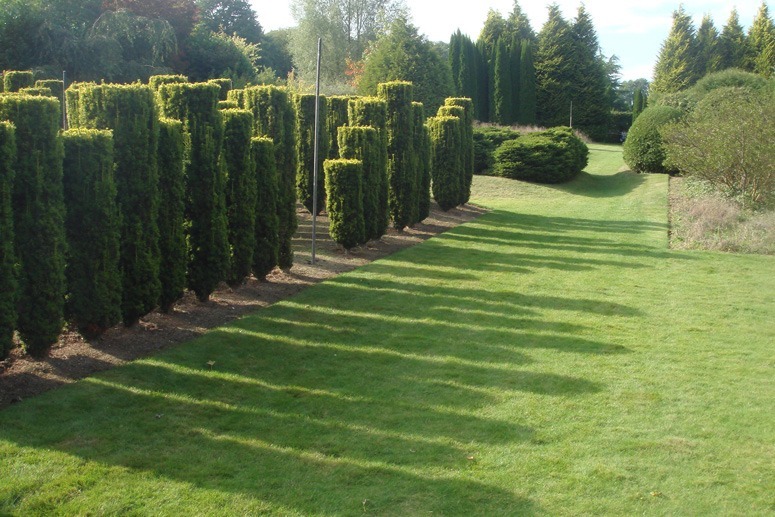 In the classic French manner there is much use of box and topiary, but not only to provide the framework of the garden as you might traditionally expect – here the evergreen sculptures provide the form, the content, the rythmn and the meaning of the garden. There is one early ‘mixed border a l’anglaise’ created in the 1980’s, but after that the garden is an intricate grid of pathways and allees, rooms and vistas, all exploring a concept, and all inviting intervention and interpretation by the viewer. Charles Jencks garden was criticised last year for having become a ‘monologue’ instead of a ‘dialogue’, but Yve Gosse does not speak so much as open the pages of his book for the viewer to make up his own mind. The Council of War – monumental, menacing or amusing? 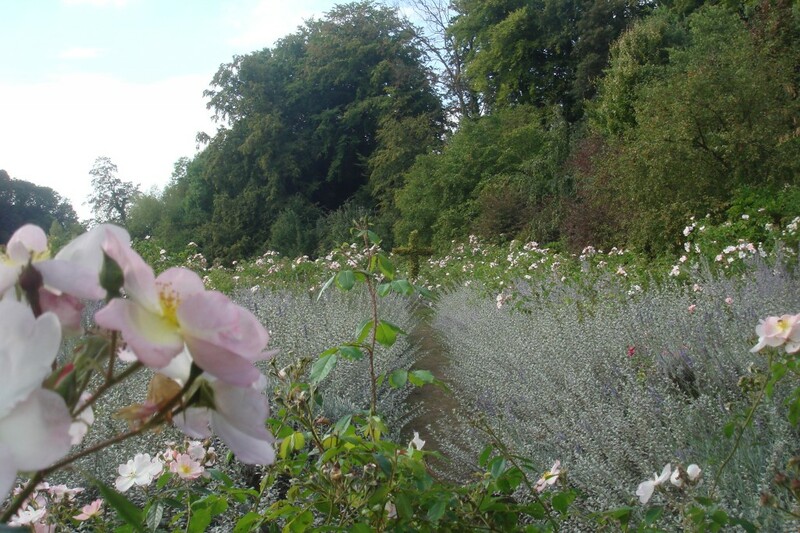 This entry was posted in Garden Design, Garden travel and tours, Garden Visiting and tagged Conceptual gardens, French Gardens, Sericourt on 8th November 2009 by Marian. Sometimes the best way to see something – is to see it differently. Thanks to Christo and his project Wrapped Trees, Fondation Beyeler and Berower Park, Riehen, Switzerland 1997-98 the humble tree can be seen more clearly as part of the three dimensional compositon of space. The exaggerated sense of presence wrapping the tree affords gives a greater sense of volume, solid and void and perspective to the overall scene. This entry was posted in Garden Design and tagged Garden Design, Landscape Architecture, public art on 7th November 2009 by Christine. So the relationship between the games at Delphi and Olympia equates to that between Athens and Sparta. Athens had a fine balance between cultural and physical prowess. Sparta cared only for the physical and military. 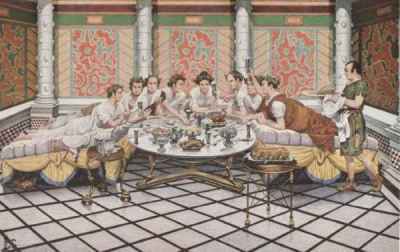 So my proposal is to scrap the Olympic Games and replace them with a new series of Pythian Games – which should balance athleticism with cultural competitions, including poetry, music, oratory and dance. It is not so much that these activities have value: it is that mind and body are part of a single organism and we should not over-develop one at the expense of the other. Or, since the language and culture of Ancient Greece was Indo-European and Central Asian in origin, perhaps we should re-form the Olympic Games on the basis of Celtic festivals. 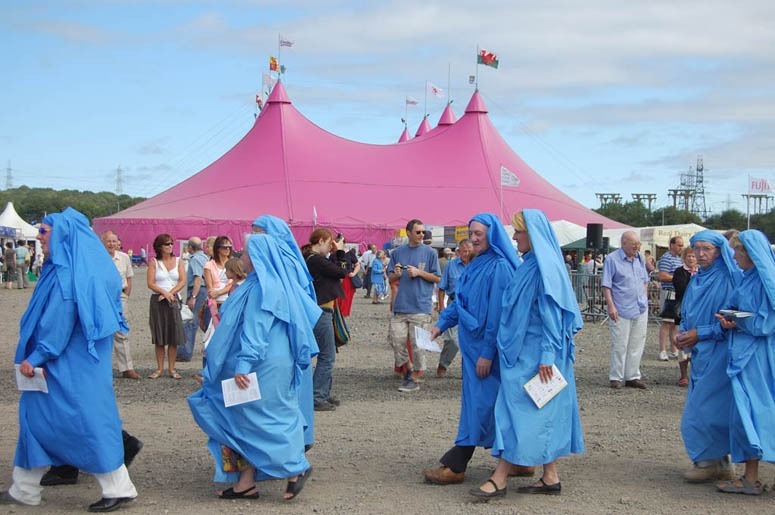 The Celts represent another great Indo-European tradition and we could look to the Highland Games in Scotland and the Eisteddfod in Wales. Anything would be better than the cynical, commercial, drug-taking body-damaging, militaristic, mindlessness tedium of the modern ‘Olympic movement’. This entry was posted in landscape planning on 2nd November 2009 by Tom Turner.